The answer to creating simplicity is often to delegate tasks that do not fit, add value for you to perform, or do not have the expertise to do so efficiently. Overly complex systems drain resources because they are inefficient. It may look like a lot of work is happening, but not a lot is getting done. Complex systems are harder to maintain and keep in compliance. It may have started out innocently enough, such as your business went through a period of rapid growth. However, it behooves you to sit back and review how well your current systems perform and where you’d like to see improvement. You may be able to accomplish everything by yourself, but there could be a hidden cost to doing so if it requires you to sacrifice personal obligations or ignore your health. Remember to keep it simple. Simplicity is deciding where to best focus your time and to delegate the rest to employees or advisors. Simplicity is the ongoing refinement of your business model to cut out inefficiencies and create the most value with your time and effort. 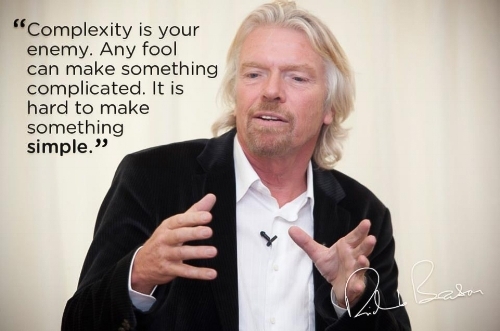 If complexity is the enemy, then simplicity is your ally.